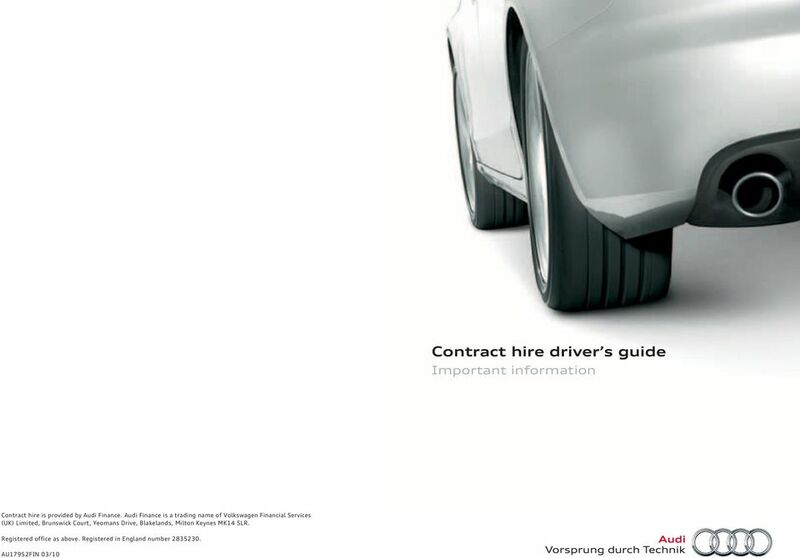 Download "Contract hire driver s guide"
2 General information This guide is designed to give you information about the services provided by Audi Finance for contract hire customers. 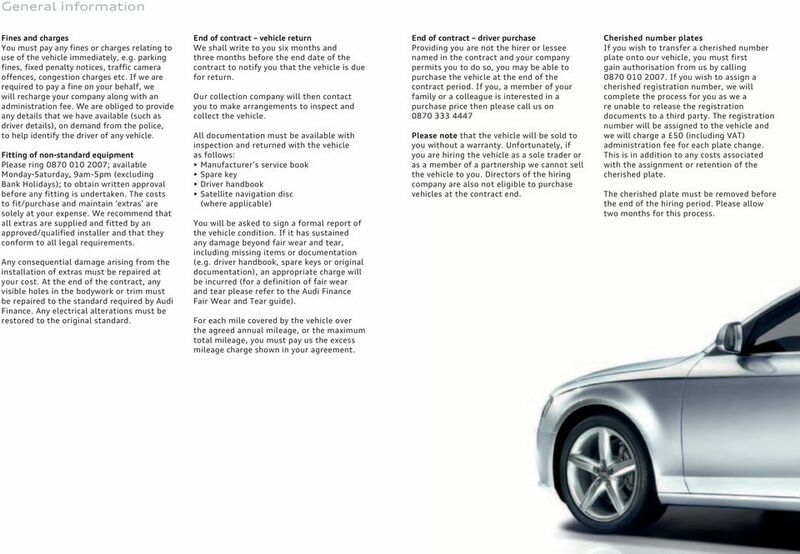 Please take the time to read it so that you are aware of what you are entitled to under your contract hire agreement. 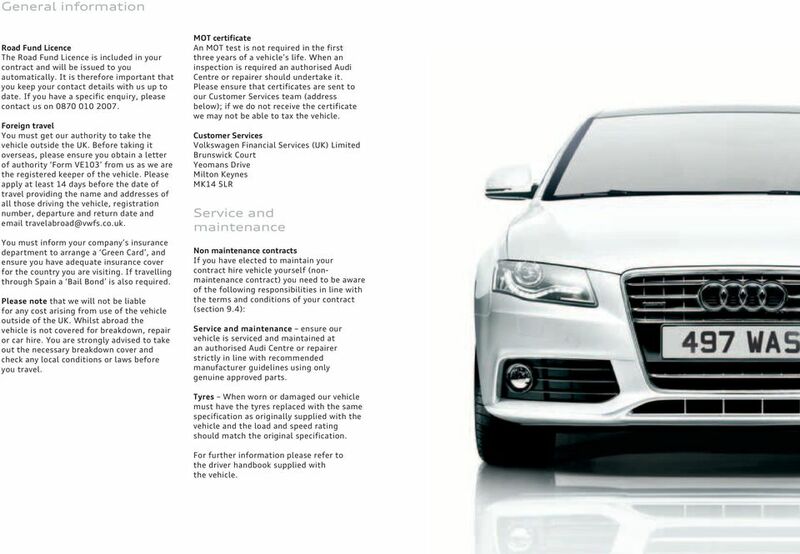 Your responsibilities It is your responsibility as the hirer to ensure the vehicle is serviced at the manufacturer s recommended intervals by an authorised Audi Centre or repairer and, where applicable, that the vehicle has a current MOT certificate. You are responsible for ensuring that the vehicle is in good repair and condition at all times and for any damage caused to, or deterioration of, the vehicle other than through reasonable fair wear and tear. To help take care of your Audi you should regularly: Check the engine oil level/coolant levels and refill as necessary in-between services Check tyre pressures, depth of tread and condition Check all lights and indicators You should follow the manufacturer guidelines on oil refills and the quality of oil to use. 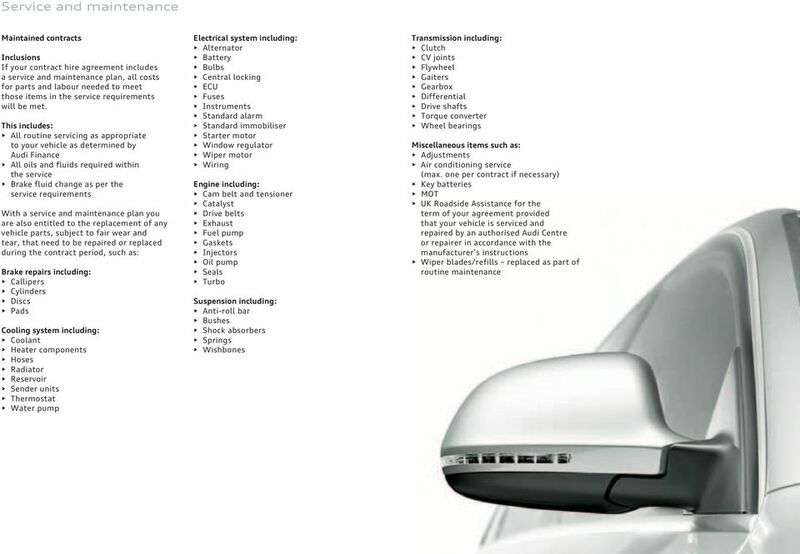 Failure to do so could significantly impact on the performance of your vehicle in a number of ways: Increased wear or overheating leading to engine damage which will, in time, devalue the vehicle Exhaust poisoning over time the wrong oil will block or poison the exhaust catalysts causing the vehicle to fail its emissions and control tests Increased fuel consumption Decreased service intervals If the vehicle is required to be repaired at any time during the contract for accidental damage or similar, please refer to specific requirements as mentioned in the terms and conditions of your agreement (section 9.4). 3 General information Fines and charges You must pay any fines or charges relating to use of the vehicle immediately, e.g. parking fines, fixed penalty notices, traffic camera offences, congestion charges etc. If we are required to pay a fine on your behalf, we will recharge your company along with an administration fee. We are obliged to provide any details that we have available (such as driver details), on demand from the police, to help identify the driver of any vehicle. Fitting of non-standard equipment Please ring ; available Monday-Saturday, 9am-5pm (excluding Bank Holidays); to obtain written approval before any fitting is undertaken. The costs to fit/purchase and maintain extras are solely at your expense. We recommend that all extras are supplied and fitted by an approved/qualified installer and that they conform to all legal requirements. Any consequential damage arising from the installation of extras must be repaired at your cost. At the end of the contract, any visible holes in the bodywork or trim must be repaired to the standard required by Audi Finance. Any electrical alterations must be restored to the original standard. End of contract vehicle return We shall write to you six months and three months before the end date of the contract to notify you that the vehicle is due for return. Our collection company will then contact you to make arrangements to inspect and collect the vehicle. All documentation must be available with inspection and returned with the vehicle as follows: Manufacturer s service book Spare key Driver handbook Satellite navigation disc (where applicable) You will be asked to sign a formal report of the vehicle condition. If it has sustained any damage beyond fair wear and tear, including missing items or documentation (e.g. driver handbook, spare keys or original documentation), an appropriate charge will be incurred (for a definition of fair wear and tear please refer to the Audi Finance Fair Wear and Tear guide). For each mile covered by the vehicle over the agreed annual mileage, or the maximum total mileage, you must pay us the excess mileage charge shown in your agreement. End of contract driver purchase Providing you are not the hirer or lessee named in the contract and your company permits you to do so, you may be able to purchase the vehicle at the end of the contract period. If you, a member of your family or a colleague is interested in a purchase price then please call us on Please note that the vehicle will be sold to you without a warranty. Unfortunately, if you are hiring the vehicle as a sole trader or as a member of a partnership we cannot sell the vehicle to you. Directors of the hiring company are also not eligible to purchase vehicles at the contract end. Cherished number plates If you wish to transfer a cherished number plate onto our vehicle, you must first gain authorisation from us by calling If you wish to assign a cherished registration number, we will complete the process for you as we a re unable to release the registration documents to a third party. The registration number will be assigned to the vehicle and we will charge a 50 (including VAT) administration fee for each plate change. This is in addition to any costs associated with the assignment or retention of the cherished plate. The cherished plate must be removed before the end of the hiring period. Please allow two months for this process. 4 General information Road Fund Licence The Road Fund Licence is included in your contract and will be issued to you automatically. It is therefore important that you keep your contact details with us up to date. If you have a specific enquiry, please contact us on Foreign travel You must get our authority to take the vehicle outside the UK. Before taking it overseas, please ensure you obtain a letter of authority Form VE103 from us as we are the registered keeper of the vehicle. Please apply at least 14 days before the date of travel providing the name and addresses of all those driving the vehicle, registration number, departure and return date and You must inform your company s insurance department to arrange a Green Card, and ensure you have adequate insurance cover for the country you are visiting. If travelling through Spain a Bail Bond is also required. Please note that we will not be liable for any cost arising from use of the vehicle outside of the UK. Whilst abroad the vehicle is not covered for breakdown, repair or car hire. You are strongly advised to take out the necessary breakdown cover and check any local conditions or laws before you travel. MOT certificate An MOT test is not required in the first three years of a vehicle s life. 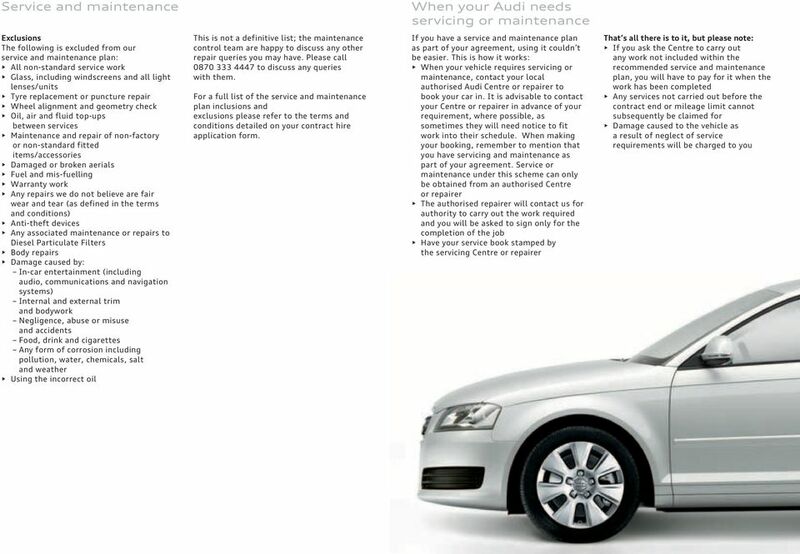 When an inspection is required an authorised Audi Centre or repairer should undertake it. Please ensure that certificates are sent to our Customer Services team (address below); if we do not receive the certificate we may not be able to tax the vehicle. Customer Services Volkswagen Financial Services (UK) Limited Brunswick Court Yeomans Drive Milton Keynes MK14 5LR Service and maintenance Non maintenance contracts If you have elected to maintain your contract hire vehicle yourself (nonmaintenance contract) you need to be aware of the following responsibilities in line with the terms and conditions of your contract (section 9.4): Service and maintenance ensure our vehicle is serviced and maintained at an authorised Audi Centre or repairer strictly in line with recommended manufacturer guidelines using only genuine approved parts. Tyres When worn or damaged our vehicle must have the tyres replaced with the same specification as originally supplied with the vehicle and the load and speed rating should match the original specification. 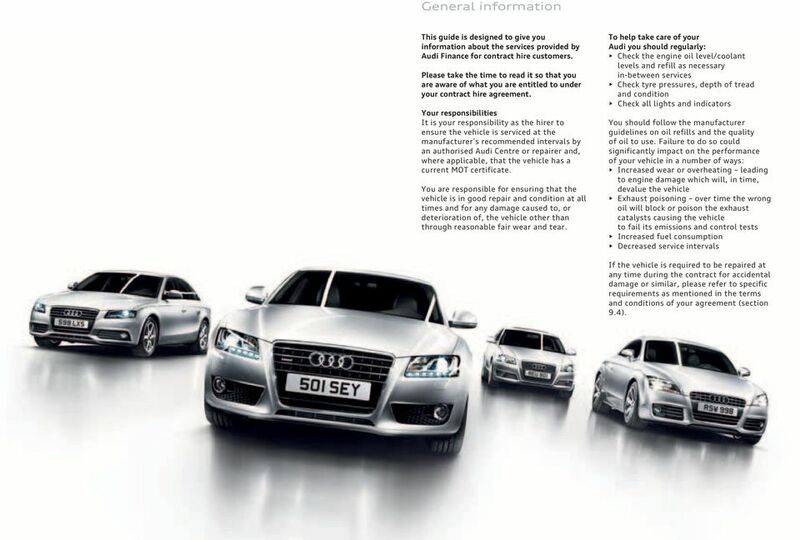 For further information please refer to the driver handbook supplied with the vehicle. 7 Tyres Tyres are some of the most likely vehicle components to suffer wear and tear. Drivers should make regular checks in order to keep within safety and legal requirements. If your agreement includes tyres this means replacement tyres are provided when necessary due to fair wear and tear. Therefore brand new tyres will be supplied and fitted during the contract period. We will specify the make of any replacement tyres and they can only be repaired or replaced by a tyre specialist authorised by us. The coverage applies to the standard tyre fitment for your vehicle. 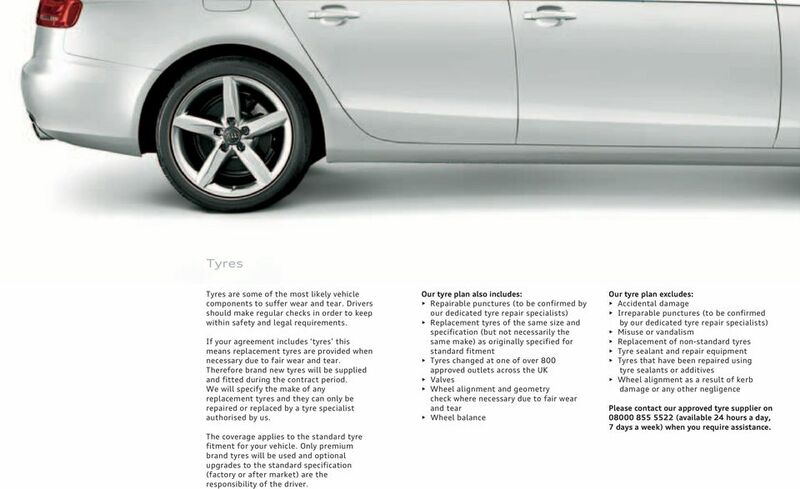 Only premium brand tyres will be used and optional upgrades to the standard specification (factory or after market) are the responsibility of the driver. Our tyre plan also includes: Repairable punctures (to be confirmed by our dedicated tyre repair specialists) Replacement tyres of the same size and specification (but not necessarily the same make) as originally specified for standard fitment Tyres changed at one of over 800 approved outlets across the UK Valves Wheel alignment and geometry check where necessary due to fair wear and tear Wheel balance Our tyre plan excludes: Accidental damage Irreparable punctures (to be confirmed by our dedicated tyre repair specialists) Misuse or vandalism Replacement of non-standard tyres Tyre sealant and repair equipment Tyres that have been repaired using tyre sealants or additives Wheel alignment as a result of kerb damage or any other negligence Please contact our approved tyre supplier on (available 24 hours a day, 7 days a week) when you require assistance. 8 Replacement vehicle If your agreement includes the provision of a replacement vehicle due to either accidental damage or mechanical defect or both, you will be entitled to a replacement vehicle after 48 hours. Please contact the Customer Services team on to arrange this. Once the contract vehicle is back in service, the replacement vehicle must be returned immediately, or a charge will be made for each day that it is retained. Please remember that you/your company will be required to insure the replacement vehicle and that the cost of any fuel used is your responsibility. The replacement vehicle must be returned with a full tank of fuel, otherwise you will be charged. Normally you will need to present your driver s licence before taking the replacement vehicle. With accidental damage your entitlement to a replacement vehicle is subject to you providing a copy of your insurance claim form, if we ask you to do so. The replacement vehicle is provided for a maximum period of 28 days during the contract. Please note that a replacement vehicle is not available outside of the UK. Whilst abroad your vehicle is not covered for breakdown, repair or car hire. You are strongly advised to take out the necessary breakdown cover and check any local conditions or laws before you travel. Understanding your business to partner your journey. Working with you to deliver the best financial solution. Vice President of Human Resources. Name other related enterprise policies both within or external to this policy.